The Zoo is part of the FarmVille’s breeding buildings where you can place and harvest some of your animals. It’s quite handy to have one of this building for it keeps your animals in one place and you can harvest them all with just one click. Harvesting animals that are placed inside the Zoo will also counts towards animal mastery and even for quest. The Zoo building has a one day harvest cycle so it will be very useful especially for animal mastery quest considering it will take several days to harvest an animal if it’s not placed inside a Zoo. 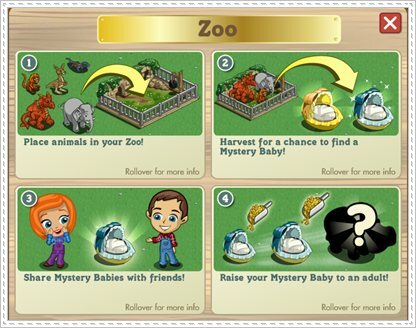 There’s also a chance to get a mystery baby everytime you harvest a Zoo. In case you don’t have a Zoo yet, you can build one by purchasing an unfinished Zoo for zero coins (for the first Zoo building) at the market. 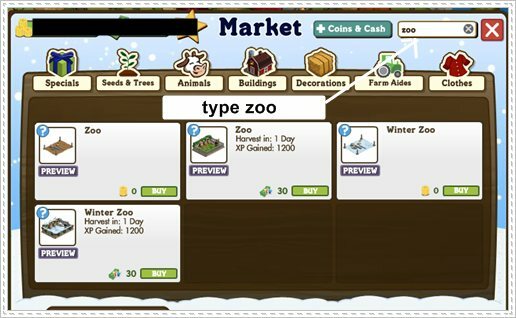 Just type Zoo in the search box of the market. Note: Go to request link page if you’ll need to ask a friends for the Zoo materials. Once you placed the unfinished Zoo, you will be needing these items to finish it. 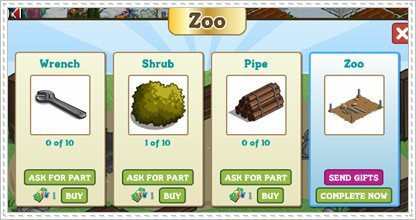 After finishing and completing the items required, you can now placed your animals in your newly build Zoo.